To use the Boolean Modifier select the desired mesh Object then add a Boolean Modifier. When you add the Boolean Modifier for an object, Blender will need a second object to be the target of the operation. You can use open or closed meshes, as long as they have available face normals for the calculations to take effect. You can add one or more modifiers of this type for an Object but you can only apply one operation for the Boolean Modifier at a time. This is a dynamic real-time modifier! 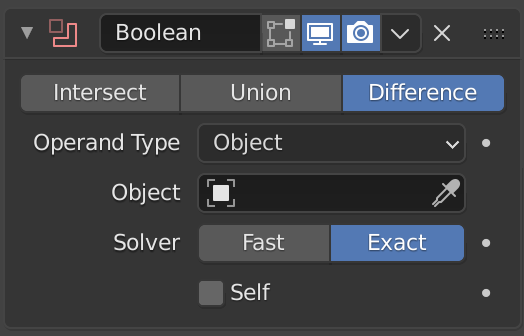 If you have marked your Objects to show the Edges (in Properties Editor ‣ Object ‣ Display, enable Wire), you will see the Edge creation process while you are moving your Objects. Depending on your mesh topology, you can also enable X-Ray and Transparency and see the topology being created in real-time. Which boolean operation will be used. The modified mesh is subtracted from the target mesh. The target mesh is added to the modified mesh. The target mesh is subtracted from the modified mesh. The name of the target mesh object. Determines what set of algorithms are used to calculate the boolean operation. Carve uses the external Carve Library while BMesh uses Blender’s built-in library and should give better results. Boolean operates best on water-tight meshes, where inside/outside is clearly defined. The following characteristics are known to give bad output. While they may not fail in all situations, they aren’t guaranteed to work properly.